We arrived in Bali at night and had fortunately pre-booked a shuttle to our hotel. There are plenty of taxis outside the airport, if you’re OK with a little back and forth in negotiating prices to your hotel, you’re in the right place. I, on the other hand, prefer to be picked up hassle free. I am glad that we arrived in the evening because our trip to the hotel was cool and traffic free. In our younger days, I suppose we could have explored the night on arrival , instead our old souls checked in, got comfortable and had a restful sleep to start the next day fresh. 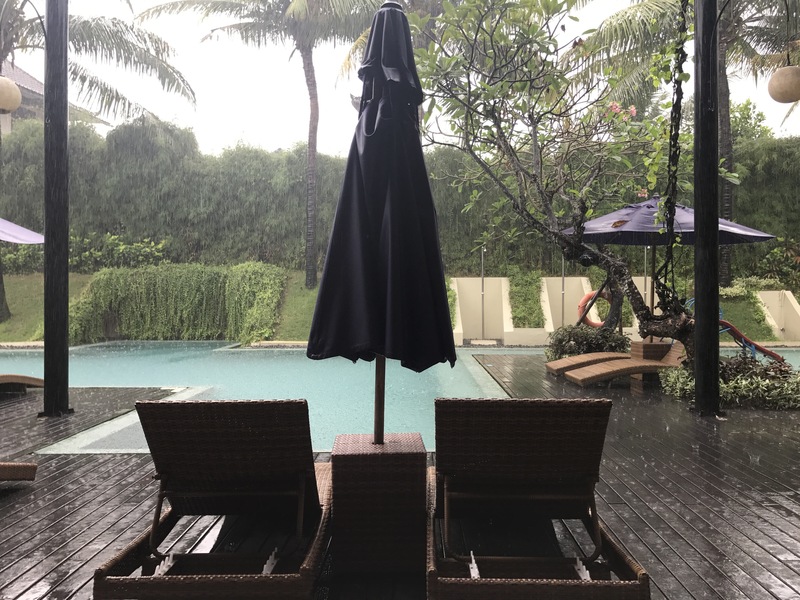 We stayed in a resort in Seminyak, for 4 full days. Before our trip, we did some extensive research on where in Bali to stay within our budget. 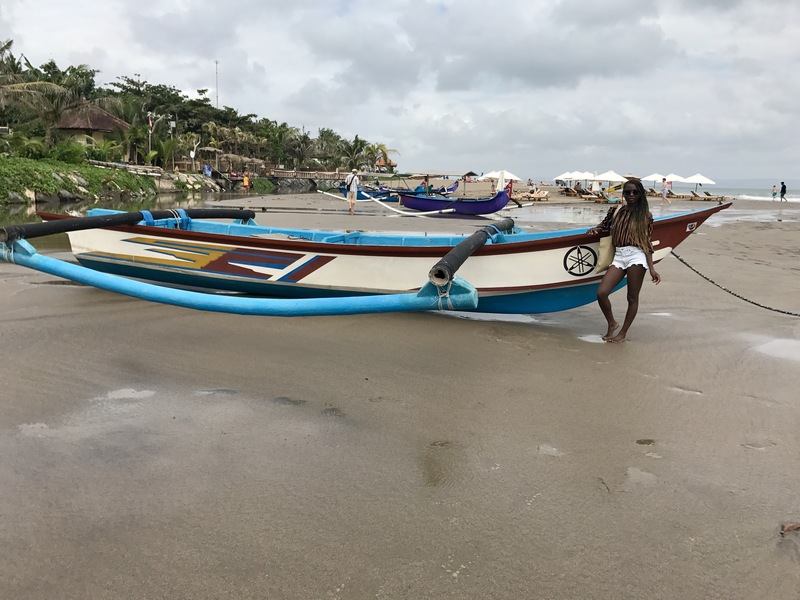 All evidence pointed towards staying away from Kuta, unless you’re a wild party animal waiting to unleash your drunken inhibitions. The last thing we wanted was to be bombarded by overly excited students. Seminyak was the tamer option, and it was one we did not regret. The 2-bedroom chalet had self-catering facilities (fridge, stove and cutlery), a nice touch which we were not expecting. It’s recommended that visitors drink bottled water whilst visiting, the amenities allowed us to keep our water cold and quench our thirst in the sweltering weather. The resort was spacious, with a large pool, bar, fitness centre (which I visited every morning- not!) and it was perfectly kept. I appreciated the breakfast buffet every morning, a great way to prep for a day of activities. It catered for the usual English breakfast options and included the local food as well. I am not one for noodles for breakfast but those seemed popular. Our resort was conveniently located within walking distance from shops and restaurants. I must say, that there are lots of Australians in the resort and later realised that there a lot of Australian tourists in general in Bali. It’s a cost effective, tropical destination for the Aussies. My experience was that Bali is cash friendly. Because of the informal trading places, having money on hand worked out to our advantage. Be careful to change money at recognized vendors while you’re there. The best way to get around was by using a cab/taxi. Uber was a little controversial (as is the case in South Africa) therefore we opted for the Blue Bird alternative which also worked out to be cost effective. Be sure to ask the driver to have the meter running, to avoid unnecessary negotiations. Bali is visibly religious, there is no shortage of places of worship and alters dedicated to Hindu prayer. You are likely to find an offering of flowers, incense and other ornaments placed in small baskets at the entrance of buildings. The offerings are made daily as a form of thanksgiving among other reasons. The people were friendly, although somewhat reserved when compared to the boisterous personalities that I am used to. They communicated easily in English, after all the island is full of tourists so English is widely spoken. 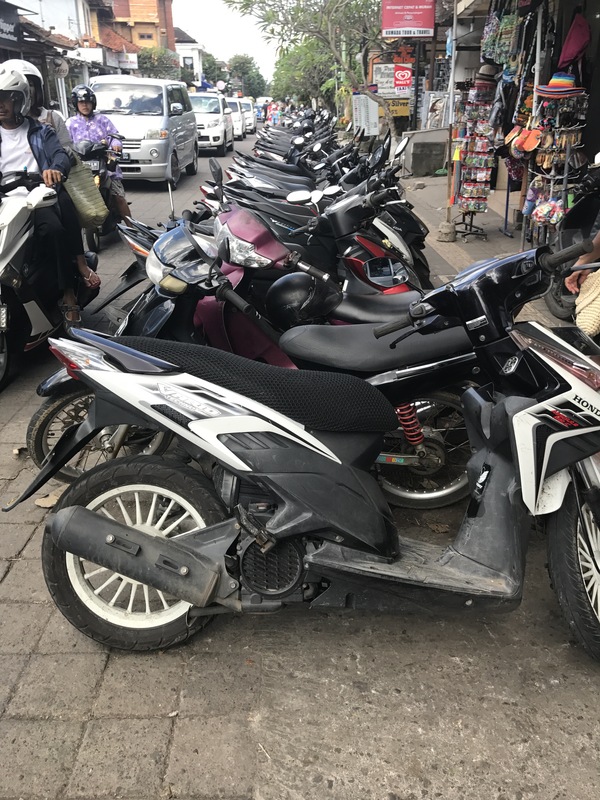 On our first day out and about, we explored the streets of Seminyak, discovering the corners, the market stalls along the streets, and gawked at the local shops. We strolled along the beach whilst enjoying the sea breeze , not the ideal place for a swim, in my opinion. The sand was brown and muddy and didn’t have that tropical clear water appeal. Mind you, I am from Malawi and our beautiful lake is a site to behold so I expect nothing less on my travels. That evening, we visited our local bar, which had a live band and undoubtedly the best mojito I’ve tasted to date, I kid you not. The band was interactive, with a full-on cover of Valerie by Amy Winehouse, sang by a dread-locked Balinese in skinny jeans and a raspy voice. Can you picture him? The type that will have you, for less than a split second, understanding why some people throw it all away while on vacay but only for less that a split second. Know what I mean? On day 2 we found the pristine white sandy beach that we had come for, the one my Lake Malawian blood approved of. The water was crystal clear, cool and gentle. We had a relaxing day on the beach, complete with coconut milk, and lots of sun burn. When the hustle and bustle gets too much on this side of town, I close my eyes and escape to this day on Pandawa beach. This beach was about 30km from Seminyak. The road to the beach was scenically carved through cliffs which loom on either side of the road,only momentarily interrupted by religions statues, watching over you as you make your way down to the water. Whilst driving down the cliff, there is a point where you can stop and enjoy an extensive view of the sea and sand from a top. It reminded me of the lookout point at Chapmans peak in Cape Town. 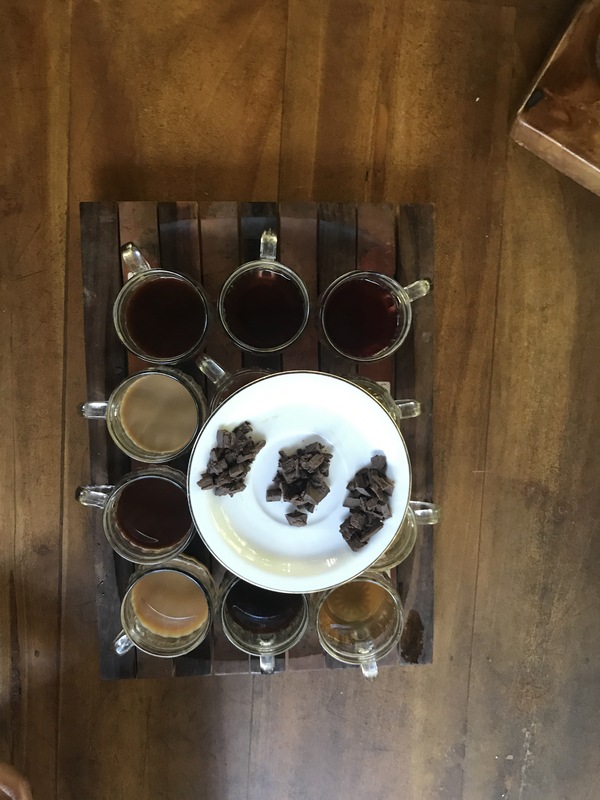 After lounging on the beach, we visited one of the farm stops for some coffee, tea and chocolate tasting. From orange infused chocolate to ginger tea and the infamous Luwak coffee. A luwak (civet in English, small cat-like animal for some of us) ingests coffee cherries. The coffee is made from the digested/defecated beans passed by the civet. This is said to be one of the most expensive coffees in the world. I couldn’t help but feel a slight pull at my heartstrings at the sight of the luwak in a confined space. Suffice to say, we walked away with some tea, chocolate and other coffee. Our final stop for the day was the Holy temple of Aluwatu. 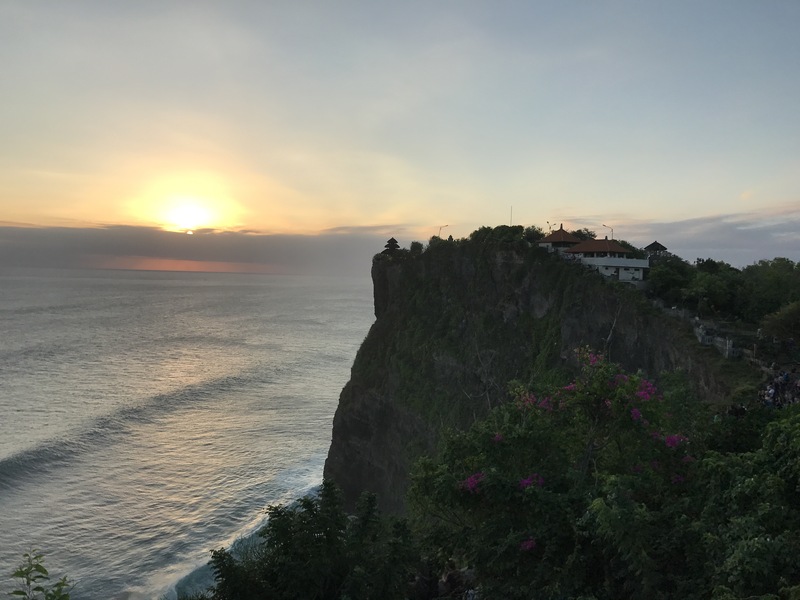 Located on the edge of a cliff, about 70 meters above sea level, the view from the temple over the ocean is breathtakingly spiritual. The sound of the waves crushing against the cliff sent me straight to church in awe of God’s creation. We watched the sun set and it was hard not to say a prayer whilst looking at the amber hues. The traditional dance and play at the amphitheatre adjacent to the temple was a perfect ending to the evening; a tragic love story enacted through dance, to the sound of drum beats. I thoroughly enjoyed the finesse and precision with which the female dancers moved in their storytelling. Two days into our trip and my heart was bursting with joy. Chat soon, in part 2 of this story.